Tiger Only! Leopard compatibility coming soon. A simple way to track any number you like. One day, one week one month at a time. Just open dashboard and enter your number for today and an 'x' will apprea on the graph. Then come back tomorrow and enter the number for tomorrow. A graph automatically shows you how it's doing over time. View by week or zoom out up to a year. Track multiple numbers by opening multiple widgets - To do this, open Dashboard, click on the (+) symbol in the bottom left, locate the TrackIt widget from the available list, click the widget and one will appear per click. - Before upgrading, open each track it widget to preserve, flip it over and press the edit data button. - TextEdit will open with the data. Save it to a safe place and keep it open. - Upgrade the widget, flip the newly created empty widget over and press Edit Data again. - TextEdit will open with a basic data file. Copy everything from the old TextEdit to the new one and hit save. If you upgraded without performing steps all is not lost. Mail me and I'll tell you how to get your data back. Looks like Apple made good on their original expiry date for Dashcode Beta. Starting yesterday Dashcode will simply display a dialog saying the beta has expired. 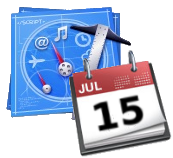 Annoyingly, this date was originally set to be after the release of Leopard allowing developers to upgrade the OS and keep working and supporting their widgets. Apple slipped the release of Leopard, but didn't similarly move the Dashcode expiry date. - Upgrade to Apple Select (for $500) and install a pre-release (flaky) version of Leopard. - Wait patiently till October. - TextEdit + Safari + Webkit debugger + a big headache. - Set the date back on your machine while starting Dashcode Beta - this, amazingly, works. You'll have to have downloaded the beta already as it's no longer available on Apple Developer Center. These are instructions on how to use other languages or dictionaries with my Word Finder widget. Requirements: Your word list in a file, one word per line, saved to the desktop. - Download this file to the Desktop. You should see the wheels turning and 14 word lists will be produced, one for each word length. - Open the 'Bingo' folder to see my lists. - Double click on the widget file and it should load into Dashboard ready to go with your word list. If you make a Widget with other useful lists or languages then mail me and I'll host it here. If you have a Widget with other lists then let me know and I can host it here. As a complement to the word checker widget, here's v1.0 of a Scrabble word finder - although it works as a general purpose anagram finder too. Simply enter between 2 and 15 letters hit return and the widget will show you all the possible words. Dictionary: The widget uses the latest international english Scrabble word list (SOWPODS). Look here for other dictionaries/languages. Enter '??' in the widget to see all two letter words. This site and widget is in no way affiliated to the official Scrabble game which is the trademark of Hasbro in the US and Canada, and J.W.Spear & Sons elsewhere. If you like the widget please contribute to the support and development of new versions by buying me a coffee: Press the button on the back of the widget.